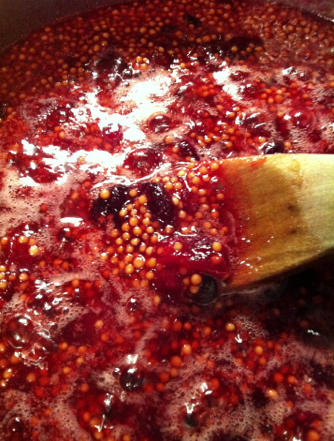 In a glass jar, soak yellow mustard seeds in cider vinegar overnight. They should swell to almost a full cup. Add more cider vinegar if they seem dry. The next day, bring the cranberries, sugar and beer to a simmer on the stove. When cranberries begin to pop, cook another 5 minutes. Add the mustard seed mixture and a pinch of salt. Taste the mixture. If it seems to sour or bitter, add a couple teaspoons of sugar. When the balance suites your taste, remove from heat and return the mixture to a glass jar. Cool in the fridge. The flavors will meld when cool. I prefer this mustard left whole, unblended as it has a wonderful texture. Makes 3, 1/4 pint jars. Store in the refrigerator. And try not to spread it on everything in site.